Introducing a Lysse first - a true pant style with front button and zip closure to add to your favorite Lysse pant collection! 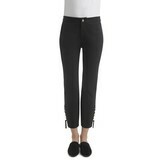 Our Lace-Up Ankle Stretch Twill Pant has lace-up detail and a fixed knot at the hem for a modern wardrobe update. Back darts contour your shape. Pair these with a knit jersey blouse for work or ladies lunch or with your favorite sweater for weekend comfort.